Parade watcher treid to stay dry Saturday, but the rain did not stop their effort to collect throws at the Krewe of Denham Springs Parade. Isabella Roblin reaches for more beads during Seventh Ward Elementary’s Mardi Gras Parade on Friday, Feb. 9. Bronwyn Cavaretta (center-right) reaches out for a stuffed animal during the Krewe of Diversion Mardi Gras Parade on the Amite River in Maurepas on Saturday, Feb. 3. Twins Abbey (left) and Aubrey Verberne, along their bother Matthew, hold out money to give to the parade riders during the Krewe of Diversion Mardi Gras Parade on the Amite River in Maurepas on Saturday, Feb. 3. Floats decked out in Mardi Gras colors will soon hit the streets — and waterways — of Livingston Parish and beyond. Here’s a schedule of the upcoming Mardi Gras parades in and around the parish this season. It’s going to get tropical when the Krewe of Denham Springs rolls out for its 39th annual Mardi Gras parade on Saturday, Feb. 23. The parade — with a theme of “Hawaiian Tropical Paradise” — is set to begin at 3 p.m. at Denham Springs High School and travel down Range Avenue to Veterans Boulevard. A toast to this year’s king and queen will take place before the parade. Congressman Garret Graves, R-District 6, will serve as grand marshal of the parade. Others slated to participate so far are bands from Denham Springs High School and Springfield High School, as well as students from the DSHS Junior ROTC program. Aside from beads, koozies, cups and other traditional “throws,” parade goers will also have a chance to catch mini-boxed king cakes — a delectable treat that the krewe introduced in last year’s parade. Anyone interested in placing a float, marching unit or vehicle in the parade is urged to contact David Stringfellow, this year’s parade captain, at davidstringfellow35@gmail.com for an entry form. The Krewe of Diversion’s 25th annual boat parade will set sail at noon on Saturday, Feb. 23. This will be the Silver Anniversary for the parade, and all proceeds raised from boat entries, donations, a silent auction, food sales and T-shirt sales will go toward St. Jude Children’s Research Hospital, through Louisiana Friends Against Childhood Cancer (LFACC). Registration will be at Manny’s Bar and Grill in Maurepas on Friday, Feb. 22, beginning at 6 p.m. The cost of entry is $35 per boat, and checks can be made payable to LFACC. Participating floats in the parade will line up on the Diversion Canal under the La. Hwy. 22 bridge and end at Manny’s Bar & Grill. Food and St. Jude items will be sold at Manny’s starting at noon the day of the parade, and the live auction starts at 5:30 p.m. (or after all participating parade boats are back at Manny’s). Last year’s parade raised nearly $52,500. For more information, call David or Vivian Stevens at (225) 939-2135 or (225) 324-5695. This year, the Krewe of Tickfaw is celebrating the Mardi Gras season twice as hard. The krewe will hold two parades over the next month, one at night and one during the day. The first will be the night parade, which launches prior to the Krewe of Tickfaw’s annual Mardi Gras ball at Tin Lizzy’s in Springfield on Saturday, Feb. 23. The night parade will start at Swamp Road and travel to Warsaw before ending at Tin Lizzy’s for the ball. Cost for the ball is $50 per head, and VIP tables are available for $600, which includes 10 entries and souvenir glasses filled with champagne. The ball is set to begin at 7 p.m. and will feature food provided by Southern Elegance Catering and music by The Russell McLain Band. This year’s charity of choice is the Tangi Food Pantry. A week later, boats will gather on the Tickfaw River for the Krewe of Tickfaw’s annual boat parade, which is scheduled to head out at 2 p.m. on Saturday, March 2. This year’s theme is “Day of the Dead,” in which people can remember their late loved ones and provide continued support for their spiritual journey. The parade will start where the Tickfaw River meets Dendinger Road and will continue to the last canal in Terry Harbor before turning back past Warsaw and ending at Boopalu’s, where the winners of the land parties and boat parade will be announced. Boat entries per parade will be $30. For more information, visit the “Krewe of Tickfaw-Mardi Gras on the Tickfaw” Facebook page or call (985) 974-7620. The Krewe of Omega parade will take place on Friday, Feb. 22. It begins with a trek through Tangipahoa Parish, starting at Kentwood and ending in Ponchatoula. It will stop at each town along the way and be greeted and toasted by the mayors. 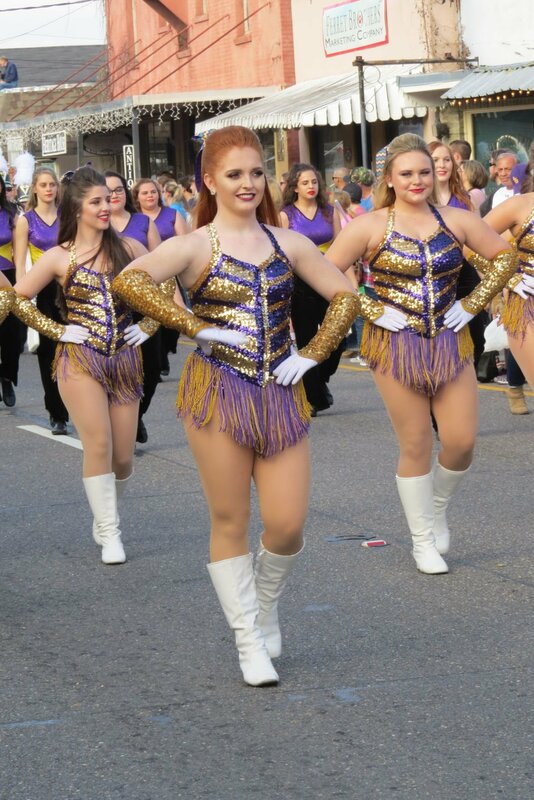 The official parade will roll through downtown Hammond beginning at 6:30 p.m. and will feature 10 large traditional Mardi Gras floats. The floats will be decorated based on this year’s parade theme, “Destinations,” and the lineup includes a King and Queen float, a Captain’s float and a Royal Court float along with members’ floats. The Krewe of Omega has been in existence for 33 years and is the only Mardi Gras krewe in Tangipahoa Parish. It draws members from Livingston, Tangipahoa and St. Tammany parishes as well as Arkansas. Livingston Parish residents have served as royalty in years past. For more information on membership, ball tickets or the parade route, see www.KreweofOmega.org or visit the “Krewe of Omega” page on Facebook. Check out these Livingston Parish headlines from the weekend of February 1-3, 2019!